1890 5c. 'posthorn' stationery envelope to Santa Ana, Salvador with image uncancelled with cds to left, arrival backstamp. 21 Apr 90 being an early usage. 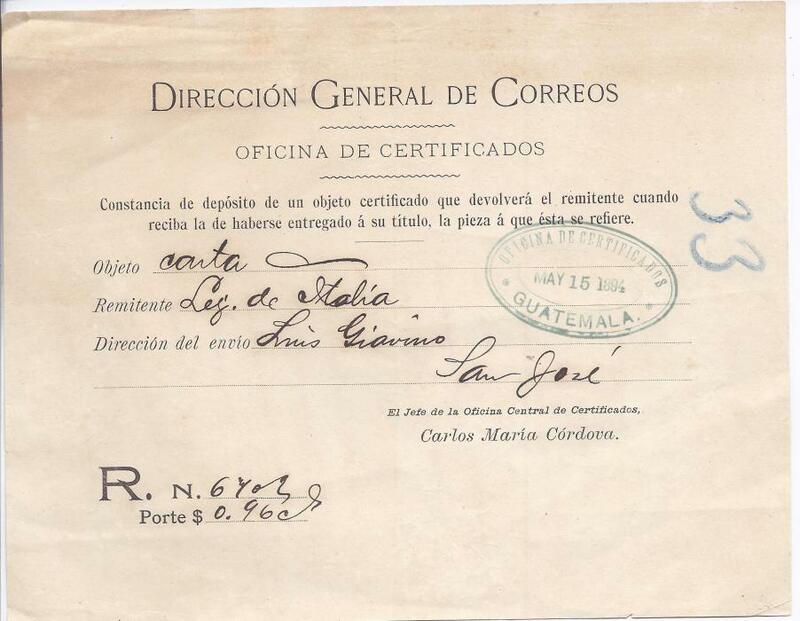 1894 'Direccion General de Dorreos' registered receipt for item sent by Italian Legation at San Jose with registration number recorded in manuscript together with the postal charge. 1895 '2 Centavos' on 5c. 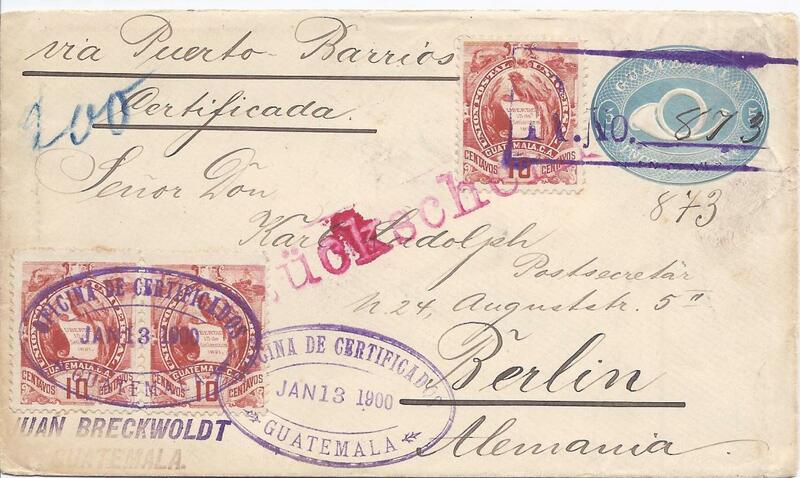 postal stationery envelope to Berlin uprated 2c. and 2c. on 1c. together with special routing label 'Via Puerto Barrios - New Orleans', these tied by '1' circular numeral handstamp and stationery image with octagonal despatch date stamp, arrival backstamp; fine and unusual. 1895 10c. 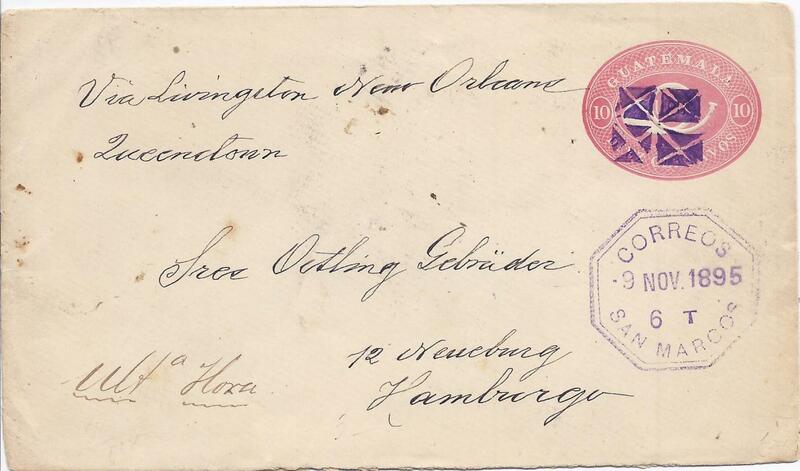 'posthorn' stationery envelope to Hamburg, Germany, endorsed "Via Livingston New Orleans Queenstown" cancelled by fancy violet cork with San Marcos despatch date stamp below, Guatemalan transits and arrival cds on reverse. 1896 2c. on 5c. postal stationery envelope to Guatemala city cancelled by octagonal Chicacao date stamp, underfranked with manuscript framed "T 8cts" and at bottom framed 'T' and '8' handstamps; envelope reduced at right. 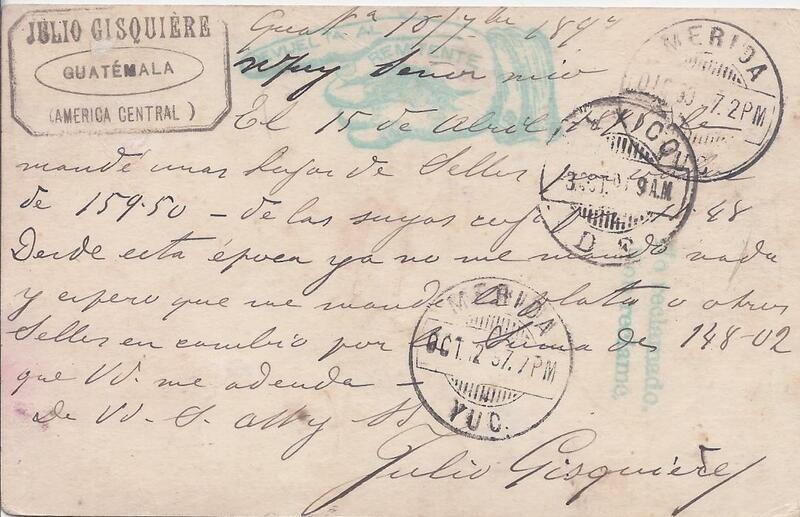 1897 Cover to Perpignan, France franked two 6c. Exhibition issue with bar cancels and one tied octagonal date stamp, company dated handstamp at left and Paris transit also tying adhesives, arrival backstamp. 1900 5c. 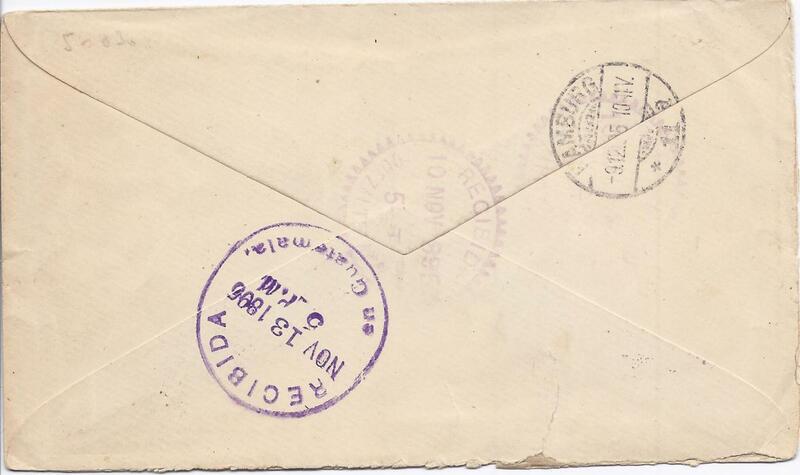 postal stationery envelope registered to Berlin uprated three 10c. Quetzal, cancelled with registration handstamp at top and oval registration office date stamp at base, sent with advise of receipt as shown by arrival handstamp. 1901 3c. postal stationery card underfranked to Loanda, Angola with violet octagonal despatch and circular-framed '1' handstamp, Paris etranger transit on front; without an arrival abd some surface abrasions, still a remarkable destination. 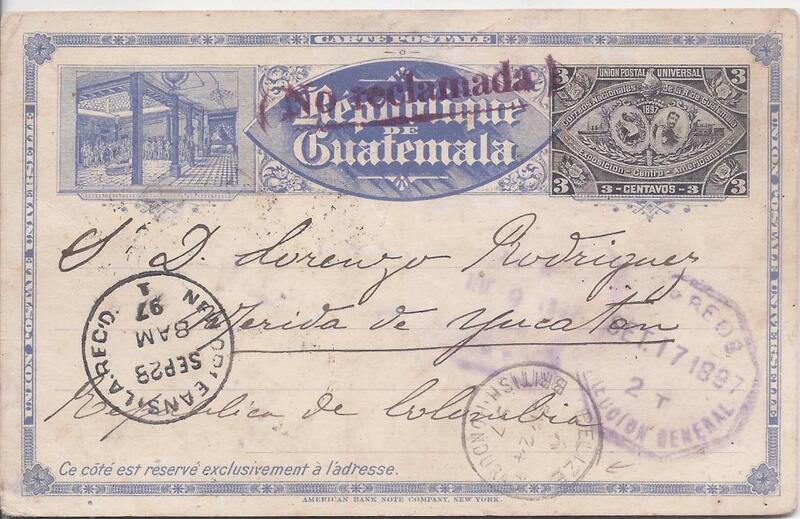 Guatemala 1897 3c. illustrated postal stationery card to Merida, Mexico, sent via Belize, British Honduras and New Orleans. Unclaimed and returned .